I’ve been promising my husband for months now that I’m going to make Jambalaya. With his birthday (and Mardi Gras) last week, it was finally time to make good on that promise. I’ve only tried to make jambalaya once before, years ago. It wasn’t bad, but it wasn’t my favourite, which is probably why I’ve been hesitant to make it again. It just seemed like a lot of work and a lot of expense (there’s a lot of meat in this dish) for something I wasn’t crazy about. This time I did my research and am proud to say I will definitely be making jambalaya again. 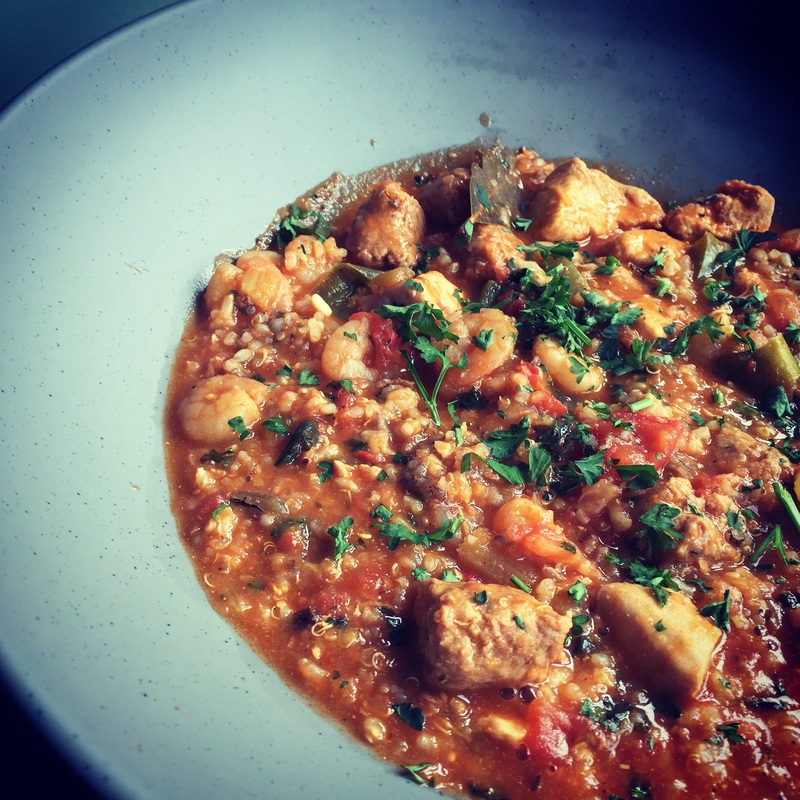 Meaty, spicy, savoury and comforting, jambalaya has a lot going on. It’s entirely worth the effort and expense. Jambalaya came from humble beginnings and was originally considered a dish to which any leftovers could be added. You can use just about any type of meat you like, but typically andouille or another variety of smoked sausage is included. I’ve chosen to use chorizo. I love the flavour of it and it’s more readily available to me than andouille. Just as there are a few different theories on it’s origins, there are also a few different methods to prepare it. Based on what I’ve read I would consider this recipe to be characteristic of the city creole jambalaya. Enjoy! Begin by removing the chorizo from it’s casing. Cut the sausage and chicken into bite size pieces. In a large pot heat the olive oil over medium heat. Add the sausage and chicken and cook for a few minutes until beginning to brown. Add the onions, celery and garlic and cook for a few minutes longer until the veggies begin to sweat. Stir in the paprika and cook for 1 minute, until fragrant. Then stir in the stock, diced tomatoes, cayenne, thyme and bay. Bring to a simmer, then reduce heat to low. Continue simmering for 30 minutes. Stir in the rice and continue simmering for another 20-25 minutes until the rice is cooked. Stir in the prawns and green pepper and simmer for a final few minutes until the prawns are cooked through. Stir in the parsley right before serving. Serves 4 – 6. Love jambalaya and this recipe looks so yummy! Love Jambalaya but have never actually made it myself. I like your use of chorizo, I love it too. Your recipe sounds wonderful. I love jambalaya but have never made it. I know my hubby and I would love this. Thank you 🙂 We really enjoyed it. Oh, I hope you do. I wasn’t overly enthusiastic when I started cooking it, but it turned out really well. We were fighting over leftovers the next day, lol. Ive heard a lot about jamabalaya but never made it. Your version looks really nice. Love jambalaya, and yours looks delicious! It looks wonderful! ! My butcher makes some fantastic chorizo, I will have to make some Jambalaya soon!